Get Started Big Island Advertising! We live and breathe Hawaiʻi Island small business. Local knowledge helps small businesses plan for reduce costs and attract more leads. We aren’t reps or agents. We’re hard-working, local, experts with decades of advertising success for our clients. Can someone off-island really provide the local service and knowledge you need to create leads at the same price? Online advertising is measurable and scalable. We’ll help you navigate the process and corellate your spend with your resulting revenue. For a monthly fee we’ll create and manage everything. Advertise everywhere but spend your money on Hawaiʻi Island. We optimize your landing pages to support your ad campaigns. All seo benefits and value you create stays in your possession. Leads are directed to your landing page. All the value we create for your brand stays with your brand. You pay for the service. Insist on creating and keeping all assets and optimization on your web properties. Our carefully managed local marketing and advertising campaigns attract targeted leads from everywhere. We specialize in a hybrid approach that includes organic and paid advertising results. You no longer need to off-shore your advertising campaigns. We’ve got the skills and experience to create and manage successful marketing and advertising campaigns within your budget. 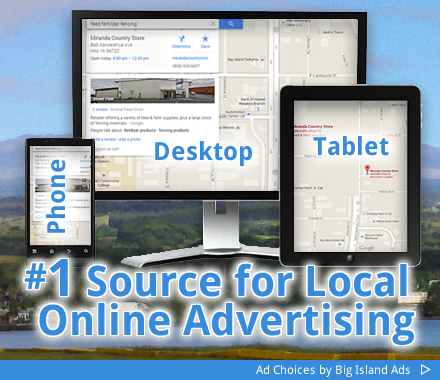 We are your #1 source for Big Island Advertising. ---Less than $500 per monthMore than $500 per monthMore than $5000 per monthNot sure, help me decide.Would rather not say. © 2019 Big Island Ads.